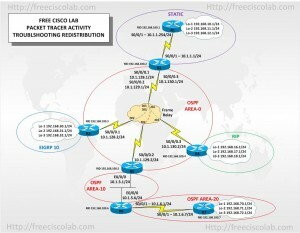 In this Free Cisco Lab Packet Tracer activity we will be troubleshooting route redistribution between Open Shortest Path First (OSPF), Enhanced Inter Gateway Routing Protocol (EIGRP), Routing Information Protocol (RIP) and static routing protocols. Understand and configure OSPF Virtual Links. Understand and configure routing protocol redistribution. The Packet Tracer activity has been preconfigured with the configuration shown in the network diagram provided with this lab activity. The network consists of a hub and spoke Frame Relay backbone running OSPF as area 0 connecting network running RIP, EIGRP, OSPF, and Static routing protocols. OSPF area 10 is a virtual link connecting OSPF area 0 and 20. The problem you need to correct is that all networks can be pinged from all other network except to and from R7 192.168.70.0, 192.168.71.0, and 192.168.72. There are routing entries in the routing table of R7 to the other networks but the networks cannot be reached from R7. You job as the network engineer is to find and repair this issue assuring full connectivity between all networks, good luck.